What are essential oils anyway? Have you been hearing a lot about them, smelled them, and perhaps even purchased them but have no idea what they are or what they do? You are not alone. The essential oil industry is a booming one, yet, as a Certified Holistic Aromatherapist, I meet people every day who are looking for direction on understanding and using these incredible healing compounds. Let’s start at the beginning. I hear it’s the best place to start. Essential oils are, ironically, not essential to the life of a plant. In fact, a very small percentage of plants—only those considered to be the oldest and most evolved—produce essential oils. These “secondary metabolites,” or products of plant metabolism, serve two main functions in nature: to attract pollinators and to ward off invaders and predators. Human physiology is quite different than that of plants at first glance. Further observation reveals there are marked similarities. Plants have a circulatory system similar to ours. Plants ingest and digest various materials and create energy, as do humans. Plants have outer coverings to protect themselves from the environment, and humans have skin. By extension, we might say that essential oils could and very well may serve similar functions in the human body, as they do for plants in the Great Outdoors. Let’s look at attraction, for example. Roses, one of the oldest plants on the planet, have developed the ability to produce famously attractive scents (essential oils) to bring pollinators, like bees and other insects, to their sexual structures in order to create offspring. Interestingly, roses and other floral scents have an affinity with our own reproductive and endocrine systems, especially having gifts of bringing hormonal and emotional balance. In a similar way, plants have an immune system of a much stronger sort when they create essential oils. These oils can deter pests, can fight off fungus, bacteria, and viruses, and can even prevent other plants from growing in the vicinity, thus, getting rid of competition. It is interest to note that modern science is now showing in myriad studies that essential oils are indeed anti-microbial, fighting off foreign invaders, and even cleaning the air. Hospitals are beginning to employ essential oils in HVAC systems to neutralize the air (though there are some emerging safety concerns about this). When inhaled into our own bodies, these amazing substances can also, over time, increase immunity as they interact with our endocrine, respiratory, and circulatory systems, though the exact mechanism by which this occurs is not fully understood. There is one additional benefit of essential oils for humans that is more difficult to observe in the plant kingdom, and that is the benefit of uplifting and harmonizing the mind and the emotions. The sense of smell is the fastest and most ancient sense of our five. Scent is information to our brain and to our body. When the molecules of scent interact with our olfactory bulb in our nose, information about our environment is then transmitted, via electrical impulse, to the limbic system of the brain, responsible for our fight-or-flight response, our autonomic and sympathetic nervous system, our endocrine system, and by extension, every single cell in our body. This information—if it is smoke from a forest fire—can be a warning to run. Conversely, a pleasant scent indicative of rest and calm—such as flowers or a conifer forest—can tell our nervous system to “rest and digest.” When the nervous system can enter this mode more frequently, the body can take time to find equilibrium physically, emotionally, and mentally. Therefore, nearly any essential oil can help to improve mood and deal with stress. Now, a disclaimer before we finish today’s lesson: just because something is natural does not mean it is safe. Essential oils are extremely potent substances, as strong or stronger than medicine. 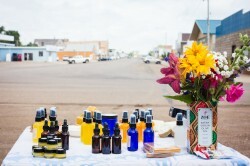 The amount of essential oil our ancestors were exposed to on the diffuse breezes of a natural environment would be far less than the types of exposure now being recommended by many companies and entities. It is imperative out of respect for our own physical adaptations and limitations to use these healing liquids safely.